Compared to the majestic Dolomite peaks all around, with an altitude of 2,835 meters the Lagazuoi is a relatively low mountain and this is of advantage for the panoramic view. 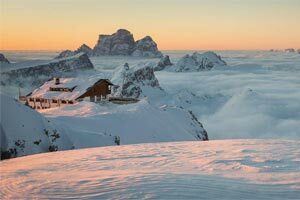 Once you reach the summit, you can admire the Dolomites from a privileged position: this mountain is high enough to offer a great panoramic expansion but not so high to minimize the imposing beauty of the surrounding peaks. From here the Fanes group, the Tofane (3.244 m), the Cunturines (3.064 m), Mt. Antelao (3.264 m), Mt. Civetta (3.220 m), the Marmolada (3.343 m), the Sorapiss (3.205 m) and Mt. Pelmo reveal in all their magnificence. Furthermore, thanks to the not excessive height, even untrained people can easily walk on an easy trail that leads up to the summit cross of Mt. Lagazuoi. In the distance, looking southward you can see the Pala group, the Cimon della Pala, the Latemar, Mt. Adamello, and the Rosengarten group (Italian: Catinaccio), to the west the Geisler group, the Zuckerhütl and Mt. Hochfeiler (Italian: Gran Pilastro). Looking northward you can see the Schwarzenstein (Italian: Sasso Nero) and the Hohe Gaisl (Croda Rossa d'Ampezzo in Italian). From the panoramic terrace of the Lagazuoi refuge you can enjoy this incomparable view.